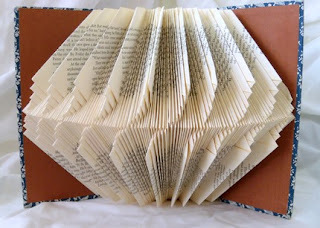 I'm a big fan of folded books. 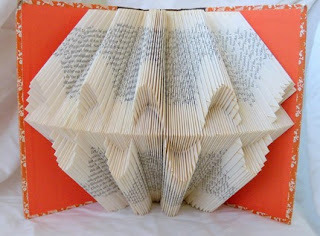 I even shared my first folded book project right here. You can see the post here. But I wanted to showcase Heather this month. I am a big fan of Flickr, so many great artists post their photos of their artwork there. That's where I met Heather and let me tell you, her folder books are gorgeous! 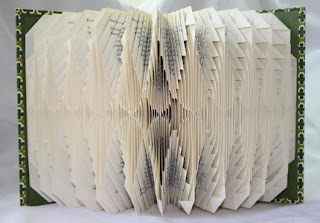 I started doing folded books but nothing compared to her works of art. They are amazing. She also has an Etsy shop where you can purchase them! Here a few of her works from her shop and you really should go visit the rest. Oh my goodness, these are fabulous. I checked yours out and it is beautiful. Thanks so much for sharing these works of art, I have never seen this done before -- the technique is fascinating! These are wonderful!!!!!!!!!!!! I'm going to have to try this. Wow - those are incredible and yours is terrific as well! I've never seen these. TFS!! Thanks for stopping by my blog Monica. I've come across a lot of interesting stuff on yours particularly the folded books... simply amazing!Never saw anything like that before.